Your business is not likely to survive today without being able to quickly integrate information across a growing number of cloud applications, hybrid cloud environments, and legacy applications. Your legacy ESBs may no longer be fast enough to help here. 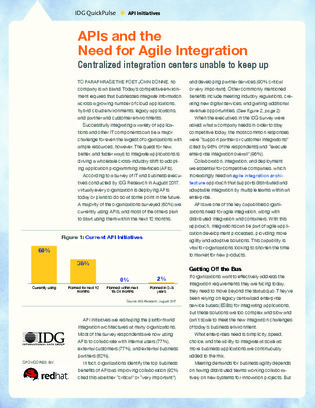 Many are turning to APIs with an agile integration approach for increased scalability, flexibility, and reusability. Open this quick product sheet to learn more about pairing your APIs with an agile integration approach, and the steps you can take today to move in an agile direction.